DAMN, I've missed fashion fierceness here on the blog. Seems like a while since I posted anything fashion-y but rest assured I've been out and about shooting so many ootd looks that I can't wait to show ya! 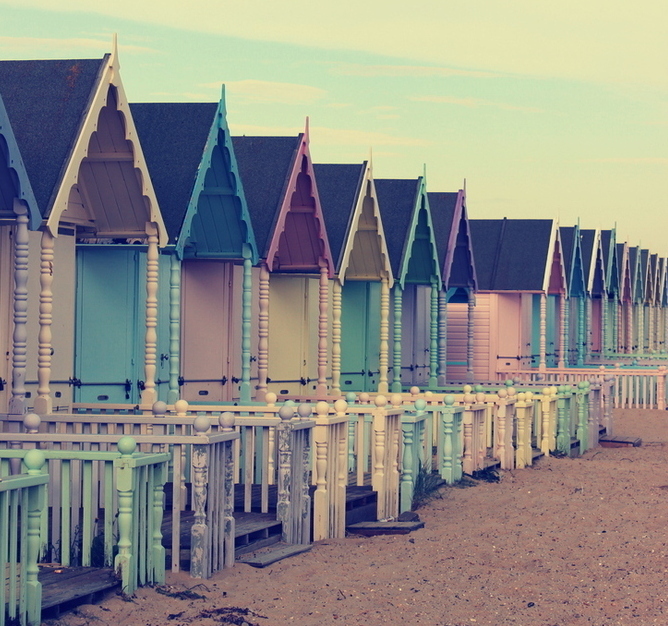 These beach-huts have to be the dreamiest I've ever seen. POWER to the PINK one especially! They're definitely straight outta fairytale territory, us bloggers and our babelicious beach-huts make for girl gang goals. The dress is from the cool kids at Kiss The Sky, it literally jingles and jangles every-time I walk due to the coin embellishment on the hem which throws up a lot of mystified stares from strangers and bemusement from work colleagues alike, but what the hell, it's all good fun. The bright burnt orange hue screamed sunshine, and my trusty ASOS holographic beach bag finished off the summery soul of the ootd. I made the tough call to quit my job last Wednesday. Sometimes things get a little too hard and I've been trying to juggle a full time job, my blogging and writing my book, giving all three a good shot but struggling with each. I've got a month before I go and am definitely feeling mixed emotions, but I know ultimately I've done the right thing for both my health and happiness. My anxiety's been bad, I come home from work to do nothing but work, usually getting late nights, feeling drained day in, day out and getting frustrated that the book I'm writing is frozen on page 248 in the midst of a dramatic, tumultous rooftop scene (and has been since March). My blog posts have been (for lack of a better, less Cher Horowitz phrase) happening way too sporadically. I will probably never be one of those super organised bloggers who can post every day of the week but nevertheless, a post once a month, or (if I'm lucky) every two weeks isn't cutting it for me, especially when I want to make this whole business boom. Regarding my job, I'm definitely going to miss a lot of people there that I've been lucky enough to strike up friendships with, and when the times comes I know I'll be sad. I feel lucky to have such a strong support system; namely my lovely boyfriend Graham for always believing in me and standing by me, especially when talking dreams, not to mention my parents & of course you gorgeous girls that have been there for me from the start of soinspo! There are a few people that I try to forget about that I've felt judged by in the past when talking blogging and writing, certain people that urged me to carry on with admin, even though the people at my actual job are 100% supportive - urging me to go and follow my heart. It's nice as my work colleagues have been really sweet and supportive about my blog, my book and my decision to leave. Most people I've spoken to have a really forward-thinking encouragement when it comes to going for goals and dashing towards dreams which makes a nice difference in comparison to some previous jobs I've worked at where those values were never really understood or respected. Blogging, Youtube and starting your own business has become the norm with an upheaval of the population reading blogs and watching vlogs which means it's more relatable and admired than even a year or so ago. Update: I've just seen that gorgeous Georgia from Tea and two sugars has graduated, and I wanted to say a massive congrats to the moon and back! Georgia is such a dazzling star, someone so special, so talented and so inspiring, always killin' it with such gorgeous, beautiful shoots and she has the most magical, wondrous way with words. I feel so lucky to know her through this blog. I just know you're going to soar to the stars in life, your talent knows no bounds. Hard work pays off! Love to you babin' butterly! Girl! The photos are beautiful (as usual!) And I love the dress! Good for you, you've gone with your gut and in my view that always leads to good things. There's nothing worse than feeling totally burnt out all the time. Ahhh, I love your style so much- I'd love to spend a day playing dress up in your wardrobe and shooting awesome pics! Best of luck, my friend! You are doing what many others wish they could, so enjoy that time and use it to your advantage. It's amazing that you have such a lovely support system too - I hope you get a lot of the work done that YOU want to do. Also, you dress is gorgeous but I am just so excited about your new adventure that I couldn't help but ramble. 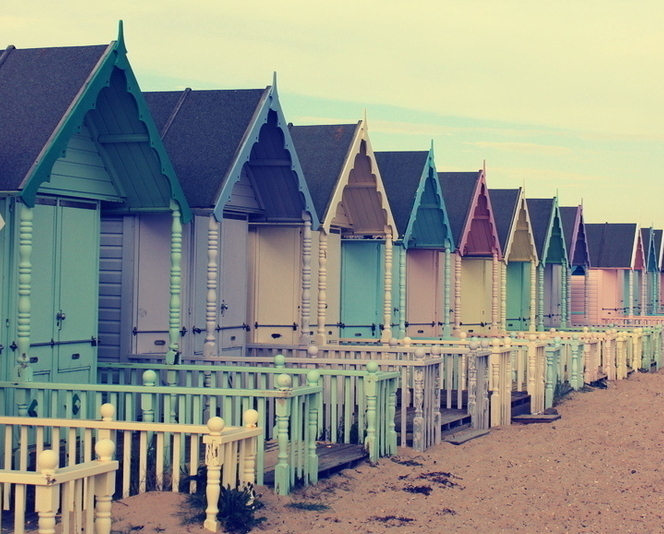 All these beach houses are the cutest things. 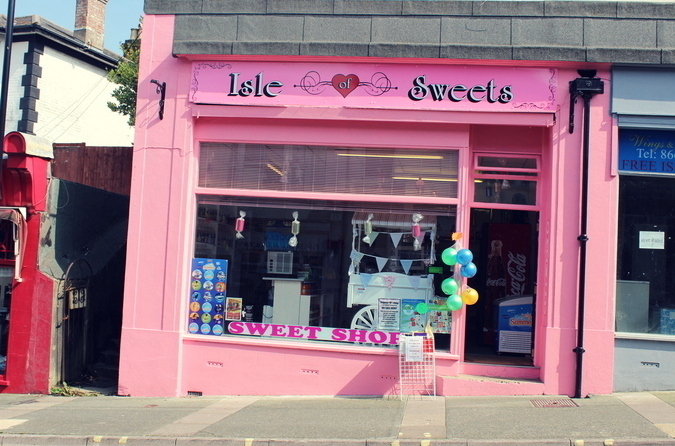 I want to stay there too! And you look so amazing as always Sophie! I love the bright colors and pattern of your dress. And I am sorry you are having a tough time at the moment. It is hard to juggle life sometimes, and I am happy that you are making steps for your sake. You deserve to be more stress free. Kisses! First of all, well done on doing the right thing and quitting your job - so many people are scared to take steps like that so I really respect you and best of luck <3 you look amazing in these pictures too, as usual! Hunni, I am so proud of you for quitting your job. I think you definitely know when something isn't right for you but it takes so much courage to stand up & admit it. It's so lovely that you have people supporting you through it all. I can't wait to read more of your posts - I always love having a day to myself to write blog posts & get organised! This outfit is stunning, I love the fact it jingles when you walk! 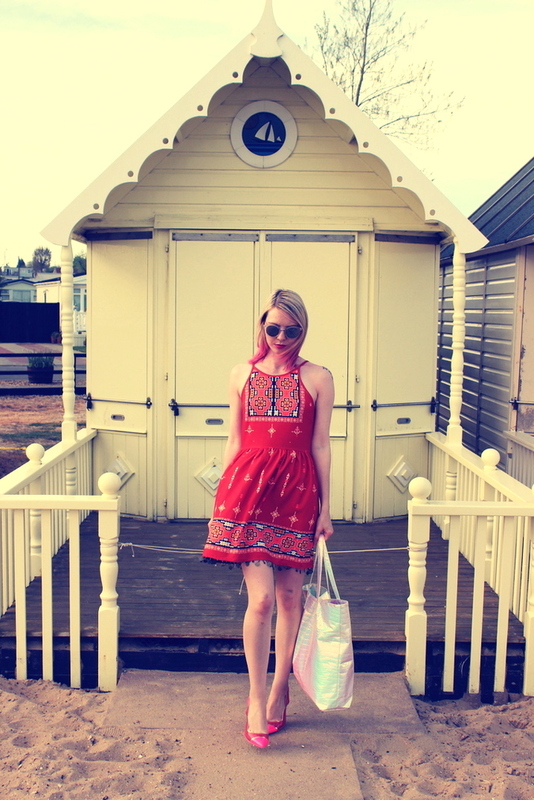 The pink beach hut is perfect for a back drop for outfit posts! This is a really beautiful look on you Sophie - I had always thought pink and red didn't work together, but how wrong I was! :) I hope that the upcoming months after you've left your job prove to be really exciting; with your dreams in sight, I've no doubt they will be! Don't ever feel judged by others, remember that the way other people treat you is only a reflection of them. Perhaps, they don't have the courage to follow their own dreams, like you do ;) Love you Soph!! This is really an amazing dress! Good for you, Sophie! Happiness is so important and you're such a talented writer, hopefully you'll have more time to work on what you love. You go girl, the fact that you have the balls to quit your job to pursue your dream is amazing! You are such an inspiration and I really wish that I could be as brave as you.. Carry on being you boo, because you is amazing!! I think you've made a great decision. I admire you so much for quitting that job to follow your dreams. I hope you have a lot of success with your book and, of course, with this amazing blog. I like your writing and your style. Btw, your dress is so good. You are an inspiration to us. soinspo.com. Unofficial use of images or content from this blog is forbidden. All rights reserved . Powered by Blogger.